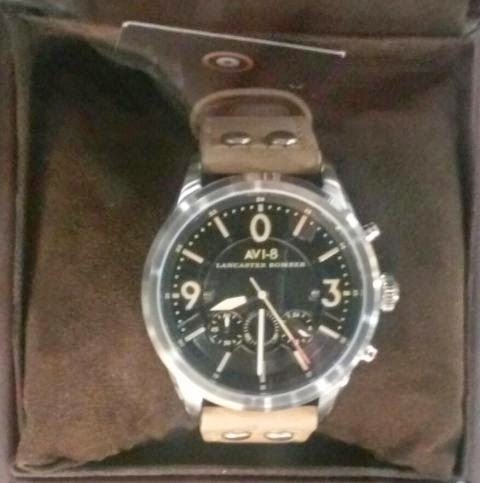 I recently caught a glimpse of the AVI-8 Lancaster Bomber watch at a local retailer. Since I enjoy my AVI-8 Hurricane watch, I was curious to see some of their other models. AVI-8 Lancaster Bomber Watches commemorate Britain's most famous World War II bomber. I like the way that the subdials are presented in a horizontal row across the bottom of the dial. While some makers present instrument panel inspired watches, it looks like AVI-8 is providing an instrument panel on their watch! The light brown band also gives the AVI-8 Lancaster Bomber watch a vintage look. The British Lancaster Bomber was a very capable aircraft. With four engines and an undivided bomb bay, it was capable of delivering the largest bombs dropped during World War II. With modifications, it could carry bombs of up to 22,000 pounds. It can be recognized by the rather upright turret over the bombardier's bubble in the nose and by its twin tail configuration. The dark paint came in handy as the British bombed at night during World War II. The Americans bombed during the day. The AVI-8 Lancaster Bomber watch comes in two configurations. The first provides the instrument panel configuration as pictured above. The second emulates the big bomber by providing a a bubble in the crystal over the date window. The bubble is larger than the magnifier on a Rolex. It's a pretty unique feature in the world of watches. It's an innovative touch in a watch that draws inspiration from history.